The swim will start at Dale's and finish at the Lake Waccamaw dam. Thank you to everyone who came out this evening to take part in our 2018 Take the Plate festivities. The personal endurance challenges begin Saturday morning with the Walk/Run. Both the 16 mile and family fun 6.5 mile walks begin at Elizabeth Brinkley Park. Those who have pre-registered for the 16 mile walk can begin any time after 7:15 a.m. The full release start is at 8 a.m. The family fun walk will begin at 8:30 a.m. Personal endurance challenge event two is the Paddle on Sunday morning. This event begins in the Dale's Seafood parking lot at 8 a.m. We expect this 14 mile event to take between 3 to 6 hours to complete depending on the fitness level of the participant. Sunday afternoon is time for the Bike events. The 16 mile Bike/Hike that will run through the Lake Waccamaw State Park begins at 2 p.m. at Elizabeth Brinkley Park. The family fun ride begins at 2:30. Remember - a bike helmet is required for both rides. Our course monitors will be removing riders from the course if they are not wearing a helmet. Monday we celebrate the traditional event that started it all - the Swim across Lake Waccamaw. The 4 mile swim will begin at 8 a.m at either Dale's Seafood or the Lake Waccamaw dam. As wind direction determines the course, please check the Take the Lake Facebook page for start location. Signage will also be posted with direction for the starting point. Monday also sees the toughest challenge of the weekend. The X-Treme combines all four events and distances into a single day. This event's start is again determined by wind direction and will either be at Dale's Seafood or the Lake Waccamaw dam. Signage will indicate the location. The event begins at 6:30 a.m. and participants must finish by 10 p.m. Thank you again for being a part of the 10th anniversary Take the Lake event! 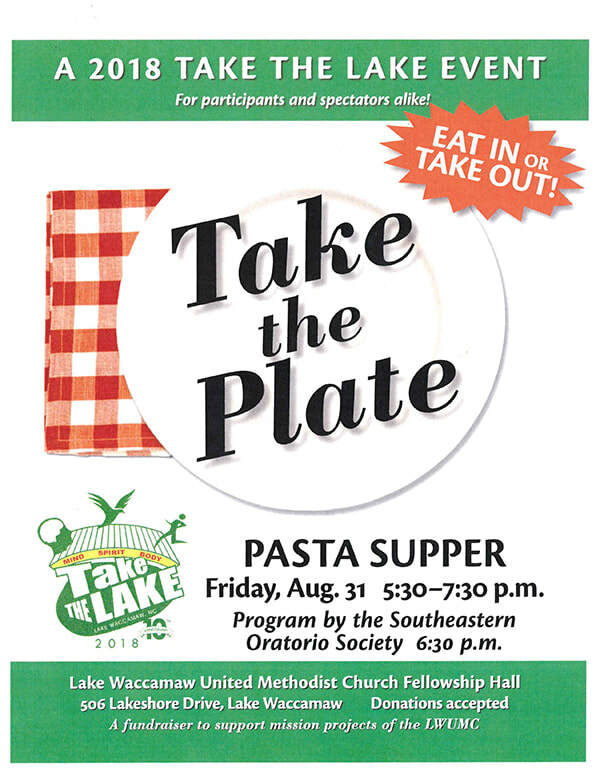 Come out to join the fun as we officially kick off Take the Lake weekend with the annual Take the Plate Pasta Supper in the Lake Waccamaw United Methodist Church Fellowship Hall. Online registration for the 2018 Take the Lake events is closed. You will still be able to register on site the day of the event. ​Thank you for your support of Take the Lake! We are just 3 1/2 weeks away from Take the Lake weekend. It is important to remember that even the family events represent personal endurance challenges that require preparation. Make sure that you are taking time on a regular basis to train in the heat to match the conditions of the weekend. Remember to train for the bike ride wearing a helmet as we require every rider to wear a helmet for the entire bike ride. Although a portion of the full ride will require a dismount to push the bike along a trail in the Lake Waccamaw State Park, the helmet is still required. As part of our commitment to safety, we will be providing water stations every 2 miles along the route. Volunteers will also be stationed throughout the course to provide support. We look forward to seeing you at Take the Lake 2018! Our website issues have been mostly resolved, meaning the time to register is now! The password protection error message has been eliminated. If you have any additional problems with the registration process, contact our webmaster - Melissa Hopkins. As you may have noticed, our website is sending some conflicting messages about schedules for Take the Lake. We are working on converting over to the 2018 dates and information, but have run into some technical complications. This has specifically impacted the opening of registration for the 2018 events. We truly and deeply apologize for this inconvenience. Please be patient with us. In the meantime, we will continue to update the blog with details about this year's 10th anniversary celebration encompassing mind, body and spirit! Also keep up with our preparations through our Facebook page - https://www.facebook.com/takethelake/. Take the Plate This Friday! The annual Take the Plate event is this Friday from 5:30 - 7:30 p.m. in the Lake Waccamaw United Methodist Church Fellowship Hall. This special event is for Take the Lake participants and spectators alike. Donations will be accepted with proceeds going to the church and a health related mission project. Honoring the health professionals theme, there will be commentary by Terrie Priest and Kim Smith. T-shirts and water bottles will be available for purchase. Online registration for the Take the Lake 2017 events is closed. We had 324 individuals register for the traditional PECs plus three individuals taking on the X-Treme! If you didn't complete the online registrations in time, there will be on-site registration for each of the events during the weekend. Please arrive a little earlier to get through the registration process. See the schedule in the post below. 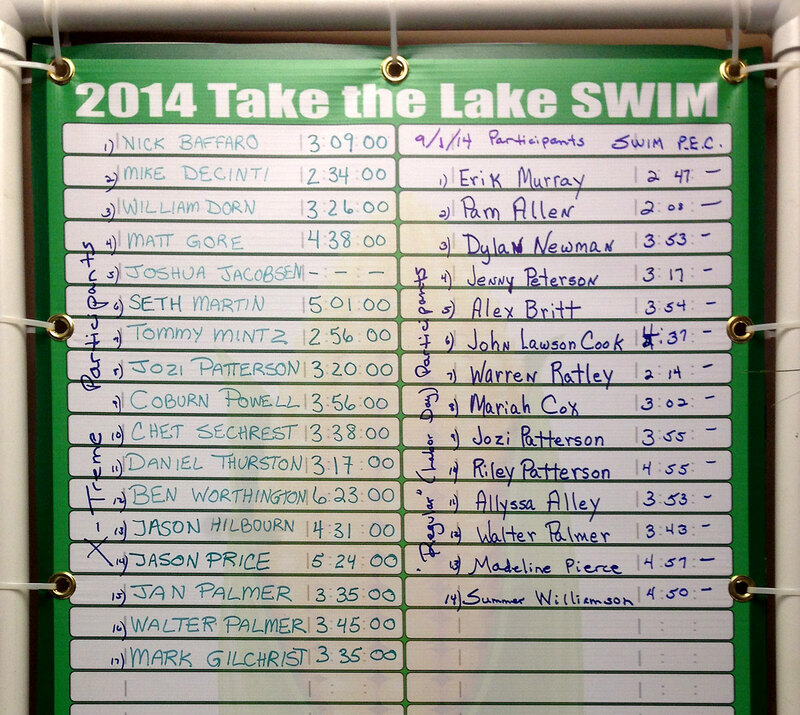 Take the Lake Registration Continues! We still have a couple weeks of pre-registration time before the August 25th online deadline. Our numbers are growing daily and the excitement is building. Banners are going up around Columbus County as the event moves closer. Make plans now to join the fun and make sure you are registered for the events you are most excited about. Lake Time Vintiques in Lake Waccamaw has joined the Take the Lake team as a T-shirt selling location. 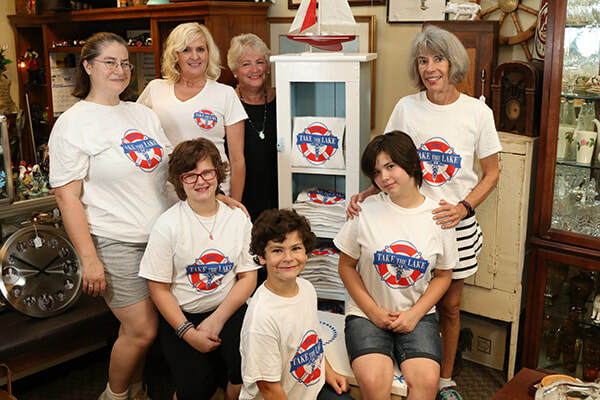 Modeling the 2017 shirts are clockwise from left Melissa Hopkins, Lake Time Vintiques Owner Marie Ganey, Donna Scott, Julie Stocks, Piper Hopkins, Amelia Hopkins and Lorelei Hopkins. Both the 16 Mile Bike & Hike and the Family Bike Ride require the use of helmets. ​While there are many locations to pick up helmets, we want to make sure you are aware of the Boys and Girls Homes of North Carolina's Country Store. The helmets come in a variety of colors and sizes at a reasonable price. The 2017 Take the Lake T-Shirts honoring health professionals are now available for purchase! There are two locations for purchase. The first is Body Shapers in Whiteville, where several members of the planning committee got together to model the shirts. They are clockwise from front left, Chet Sechrest, Julie Stocks, Walter Palmer, Jeff Faulk, Coburn Powell, Grant Egley, Donna Egley and Stuart Rogers. Shirts are also available at Lake Time Vintiques in Lake Waccamaw. ​Lake Waccamaw, NC – The challenge of swimming across Lake Waccamaw is something that served as a rite of passage for generations. It was in the 1940s that Lee J. Greer formalized the process, encouraging hundreds of youth and adults to take on the challenge every Labor Day. In 2008, in part to address the low health rating of the county, a pilot event was organized with paddling and cycling added to the events. The distances vary for each of the events. Both the walk/run and the bike and hike are 16 miles. The paddle event is 14 miles and the swim is 4 miles. For the already fit members of the community, the challenge of the weekend’s events was a significant challenge. 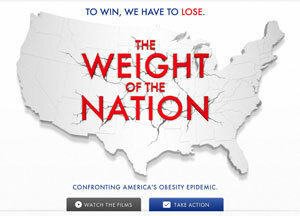 “The thing was, we wanted to continue to expand the reach to those who might not be as far along on their personal fitness journey,” said Stocks. Over the past three years, a shorter walk and bike ride have been added to the event options. Each of these events are 6.2 miles. The event, now in its eighth year, is still free for participants, although T-shirts and water bottles are available for purchase. 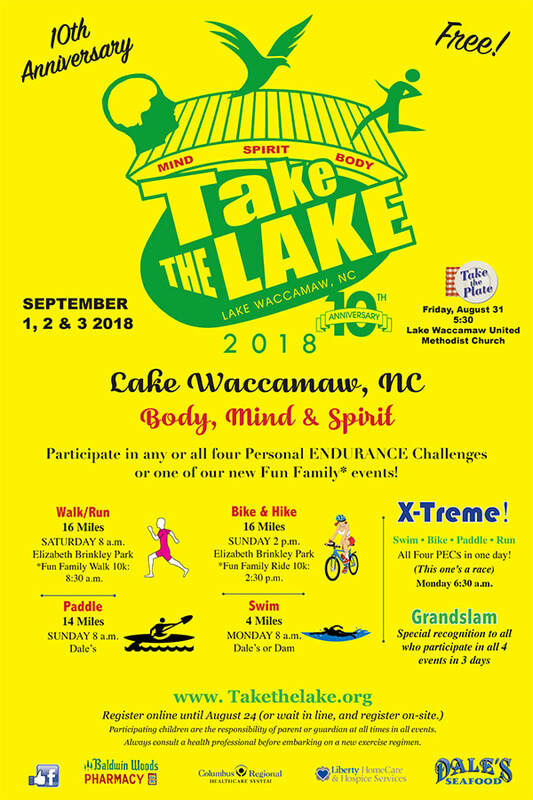 ​Those who truly want to challenge themselves do have the opportunity on Labor Day to participate in the X-Treme, where they participate in the swim, bike and hike, paddle and run/walk in a single day. While the official Take the Lake events are Labor Day Weekend, it isn’t a one weekend event. To truly enjoy participating, training must take place throughout the summer. For those already fit members of the community, Take the Lake may not seem like an activity that makes sense for them to participate in. ​For more information about the 2017 Take the Lake, visit www.takethelake.org or call 910-641-1071. ﻿Fun for all, one group at a time! As we get close to our 10th Take the Lake season,* it's fun to look back on the fun we've had, and the Take the Lake committee, volunteers, Lake residents and participants have had great fun with our different themes each year! Begun in 2011, we have chosen themes to "tip our hats" to special groups of people, and also to give them a little extra motivation. 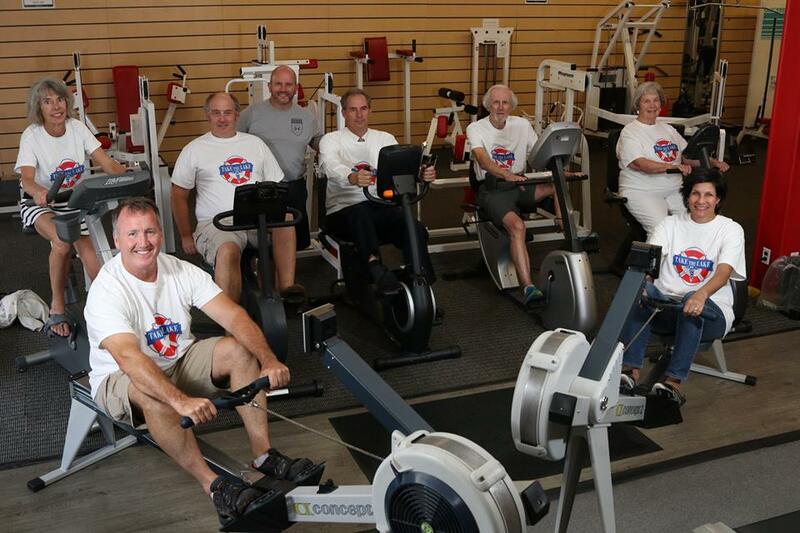 We started with military veterans, and we have shared our fun with many groups of great people ever since. ​Take a fun stroll through the TTL years, right here! 2018 - The 10th Take the Lake Training Season! The starting line for the Swim will be DALES. The finish line will be the dam. Have a great event, and enjoy your Labor Day! Tropical Storm who? Hermine couldn't keep us down, and we could not have asked for better weather for this weekend's events! We are ecstatic by the amount of people who came out and participated in the Walk/Run and Fun Family Walk yesterday and the Paddle, Bike, and Fun Family Bike today! It was fantastic fun, and you all did a great job tackling those challenges. The Swim is tomorrow and starts at 8:00 am. Assembly at 7:30 and instructions at 7:45 sharp. Participants, we cheer you, and wish you the best of luck! Take the Lake!! Don't adjust those pixels because you are seeing correctly! 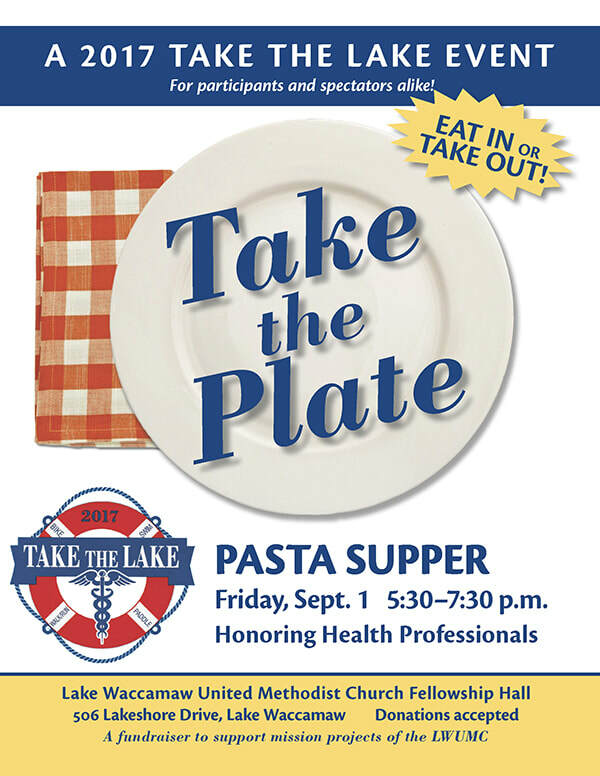 The annual "TAKE THE PLATE" kickoff event for Take the Lake weekend is this Friday, September 2, 2016 at the Lake Waccamaw United Methodist Church Fellowship Hall. Come join us for food, fun, and fellowship as we recognize the "Be Prepared" aspect of scouting across Columbus County! Get your scrumptious spaghetti plate beginning at 5:30pm, and stay for our special program honoring all Eagle Scouts and Gold Award Girl Scouts, beginning at 6:15pm. Can't stay? Come get your plate and a few for the family to take home and enjoy! All spectators and participants welcome! All donated proceeds benefit the ministries of LWUMC. The time has come, my friends! Today is the LAST DAY to preREGISTER for Take the Lake. The website registration link will officially close at 11:59 pm. Bibs for preREGISTRANTS can be picked up at Body Shapers from 8:00 am - 5:00 pm starting Monday, August 29th and will continue through Friday, September 2nd. You WILL NOT be able to register at Body Shapers. TODAY is the day to get your registration finished!! Click the REGISTER NOW button and get typing! You'll be glad you did it today!